Welcome to the Old West!! 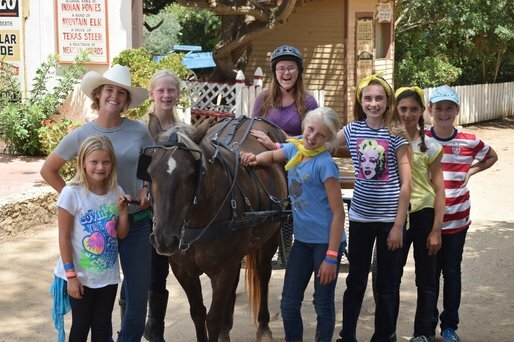 After 54 years of producing a world renowned Wild West sleep away summer camp Rawhide Ranch, right here in North San Diego County, now provides week of Day Camp each summer! The kids will ride horses, work with real ranch animals like baby goats, bunnies and lambs, pigs and chickens, go swimming and water sliding, learn archery, outdoor cooking and leather craft, equestrian vaulting and pony cart driving. They’ll also play some amazing and fun camp games like Cowboy Laser Tag and make some awesome friends, all the while having the times of their lives. ​Our incredible world class and award winning staff, including full-time camp health care professionals, are here to make sure that your camper has the best Wild West camp experience ever! They’ll also enjoy a tasty, hot lunch daily! Need to drop off early? No problem. We can receive them as early as 7:30 AM and for a little extra we can even make them a hearty ranch breakfast each morning. You just can’t beat it! Early drop off & breakfast starting at 7:30am available for $8 per day. Please purchase this option ahead of time. A Late Pick-Up fee will be added starting at 4:15pm at a rate of $3 every 15 minutes. To purchase this ahead of time please contact the Ranch office. Download & complete the scholarship application & send it in. We will make our decision in May, 2018. Please be sure to follow all of the instructions on the app. Incomplete applications will not be considered.